Early last month I was working on a design for a table runner for a publication. I fiddled and fiddled some more with it using specific fabrics and settled on a design. That I can't share, but I will share a slightly similar, yet different design. I was scavenging through my scraps and of course, there were plenty of options to choose from. I couldn't help taking the rainbow route once again. It's effective! Plus, were coming to the end of winter and color has been in short demand! 14 1/2" x 50 1/2"
I started with a deep dark red and transitioned to a deep dark blue, for a total of twenty-nine different colors. Hot and cold. The squares and snowball blocks are 2" finished. It's been a while since I made a snowball block! But I liked it! I machine quilted 1/4" lines around the center panel and added a criss-cross design in between the blocks. The rest of the quilting I kept simple. I guess you could call it the 'plaid effect'! I choose not to quilt in the blocks. I wanted to! If I had, I would have wanted to use a coordinating thread color. That is a lot of work! The backing is a print that has been lurking in my stash. In an effort to use and clear out some 'oldies', I used it for the back. A spring surprise! Anytime I make anything rainbow, my first thought is to quilt each color with matching thread. You know and I know it's time consuming. If I don't do that, I ignore the colors completely and quilt around them. My brain doesn't seem to ever go anywhere else! My question is: What do you do when you have a quilt with so many colors? How do you decide what color thread to use? With the white background I guess I would choose white thread, would I? Would you? I would choose white thread too. 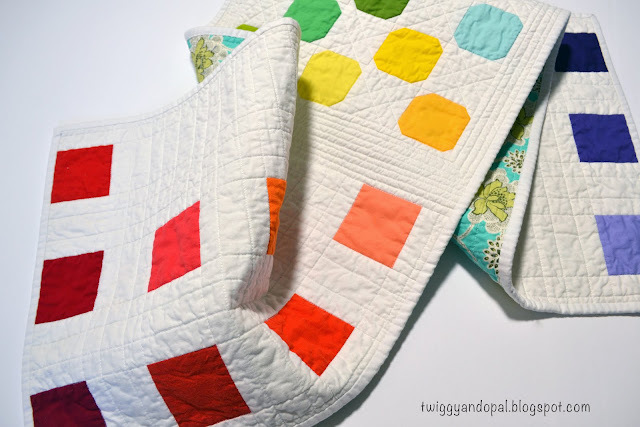 I love your octogon shapes and your quilting is cool ! Sometimes I think way too hard on things like this! It was a fun project regardless! I've just be facing the same problem and nothing looked right. I'must now trying invisible thread and after a couple of rows, it seems to be working for me. I tried invisible thread years ago. It was before I knew about burying threads, I would backstitch and snip the tread. At that time I thought it would be irritating wrapping up in a quilt with the ends of the thread. And my machine didn’t take to well to the thread either! I would love to hear how it goes for you! Do you bury the threads of invisible thread? I’m curious! It's gorgeous, Jayne! 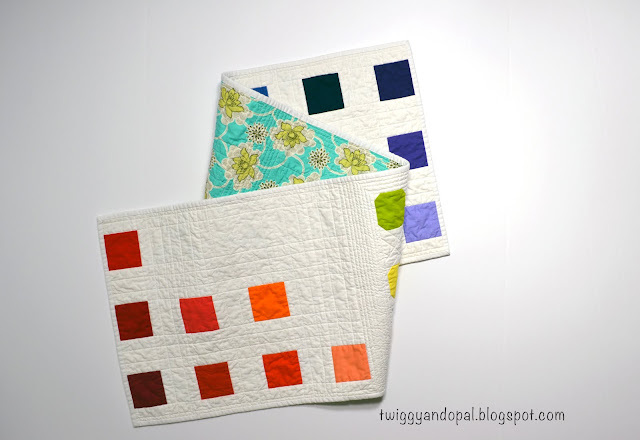 I love the effect of using both squares and snowball blocks and I think the quilting is perfect :) Lots of people seem to use Aurifil 2600 when they're quilting over lots of different colours, but I've never used it (yet). It's definitely the perfect time of year for a rainbow project. About threads - usually, I opt for multiple colors. But sometimes I do like one thread overall, and depending on the project I'll opt for matching the background, or using gold or silver thread. Last year at this time, I did up a rainbow quilt on a Kona Snow background, and metallic silver thread for the quilting turned out gorgeous! 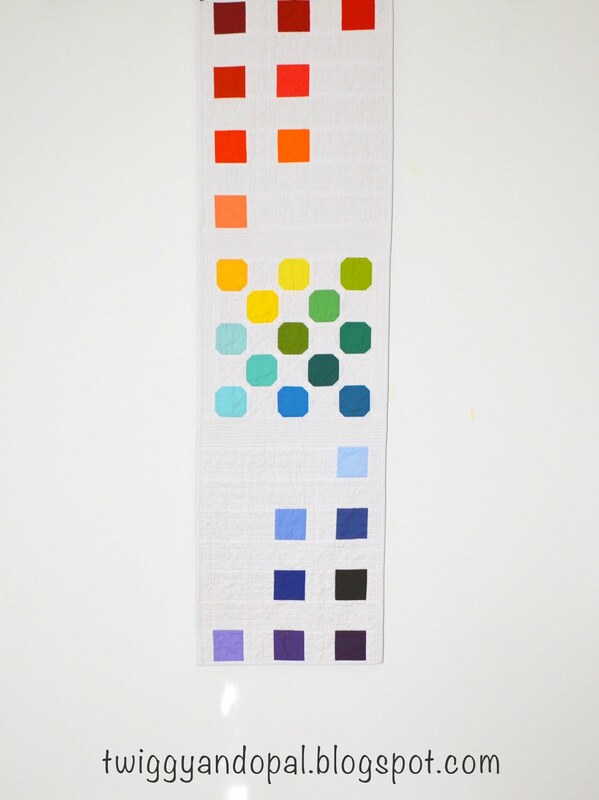 I use Aurifil 3817 when I quilt a rainbow quilt - it's mostly a blend of primary colors. Sure, sometimes the thread color will stand out but then it will change and blend. I like that in the end it's more subtle than you think it will be from an overall perspective but that it can draw you in as well. I love your runner. Thread choices can be a real question sometimes. I do like the quilting pattern you used too. Great project. Lovely rainbow, just what is needed on this drizzly miserable day. Your quilting always looks so neat and tidy. I'm not the best one to answer your question on thread choice. I usually (make that always) go with as near a match that will been in as possible, although I would use a very pale cream on a white background instead of white. There is no shortage of color, creativity or inspiration on your blog :-D Looking forward to your publication. Like Yvonne, I would probably use a variegated thread...probably on the pastel side so that it wouldn't be loud against the white. But I really like the way you handled the quilting on this. What a lovely rainbow design. I love it! I don't tend to change thread colors too much. At my quilting skill level, I am still mostly doing all over quilting. For this, I love using a variegated thread. It gives the quilting a whole new dimension. 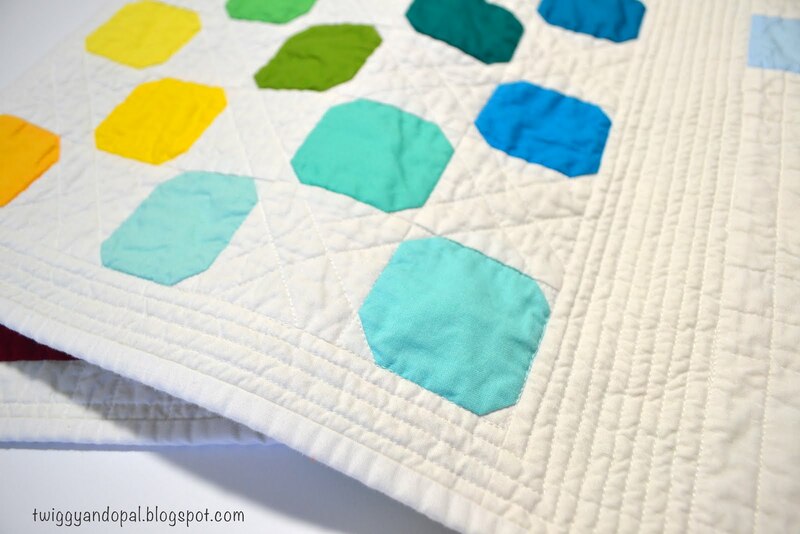 You can't go wrong with a rainbow quilt, ever! I would probably use a darker cream thread that would almost blend with the white, but not be super start against the colors. A medium gray would work, too. My machine also doesn't like invisible thread, so I have a spool of clear and one of smoke just sitting around being unused. Maybe I should just give them away, sigh. Fun runner! Just love those blues and greens in the center! Well done! 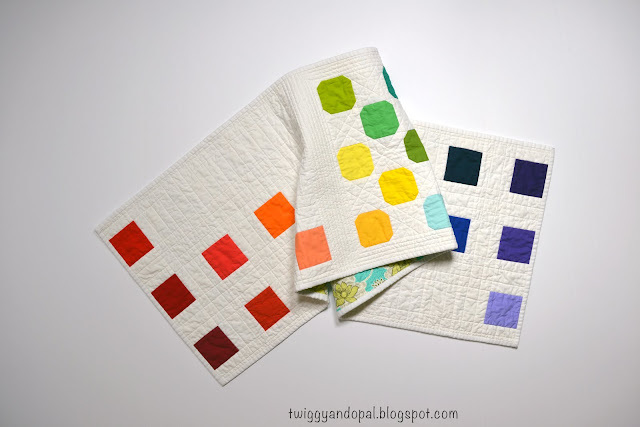 I love rainbow quilts, and I love this runner, although I'm afraid that now that I've read this post, I'm going to go to bed with an earworm of "Rainbow Connection." Oh well, that's okay. Interesting about your thread choices. I agree that on your quilt I would have probably wanted to use matching thread on the colored areas if they were quilted. But I have a lot of trouble with thread decisions and usually solve the problem by sticking with something in the white to beige or light gray range. To use up some leftover thread on my current project though, I'm using a mint green on a quilt with a very light background. I'm vacillating between loving it and wishing I had used white. It definitely seems to shift the focus from the fabric to the quilting. But it's hard to visualize how colored thread will look. I see blogs from time to time where quilters have tested out various colors on several different fabrics. It's surprising to me that often the threads seem more subtle (or less intrusive) than I'd expect. But then I'll see something where it really stands out and I don't know why that is. Maybe I need to look at them in grayscale to learn more about how the value affects the look of the quilting. Sorry to go on and on--I've been thinking about this a lot the last few days. 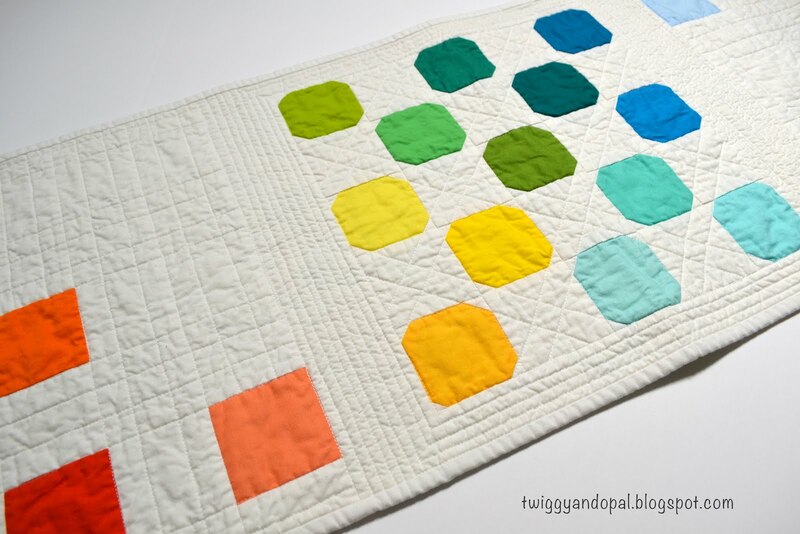 I would use a neutral grey or a medium brown for the quilting, but I like it to show nicely in white areas. It amazes me how many little pieces you love to work with!! I love the little snowball blocks, so fun. I perhaps might use a very light grey thread on this particular one. You have such a fun variety of solid fabrics, Jayne! I love how you're able to lay them out in the subtle gradations. I have the same problem making thread decisions, and I really dislike burying threads, so have a tendency to stick with the same color throughout, even if it's not the right color! Lol! I read Yvonne's comment, and decided I want to go look for that Aurifil thread she mentioned. You have so many beautiful shades of solids. I always love to see how you put those bits together. Thanks for sharing with Oh Scrap! Very fun and colorful! Congrats on a beautiful finish. What a fun rainbow, I love the runner. This is darling! I rarely quilt with a lot of white but when I do, I tend to pick white or a very light gray or tan to quilt with in the negative space. I feel your pain though - quilting over colors seems wrong using white thread but I'm too lazy to change each time!